Planning ahead for on-the-road eating can help you save money and eat better. Susan Tucker, wellness consultant and founder of Green Beat Life, LLC points out, "Preparing your own foods allows you to be in control of the ingredients and your budget. If you rely on the food choices along the road, mostly likely you will spend more than you would preparing your own meals and snacks. You will certainly be hungrier, and stop more frequently, as you will not find many nutrient dense foods. Many fast-foods are designed to make you want more!" Tucker states, "Road trips can be long and tedious, and often take a toll on your well-being and energy." She advises, "If you fortify these trips with some nutrient-dense, energy-sustaining foods, you will arrive more energized than if you consume the fast-food that you will no doubt encounter on your journey. When traveling, I always want to consider keeping my energy, digestion and nutrition in check. It makes for a better trip and arrival, and improves how I will feel post-drive." Tucker suggests, "Wraps, cut in half, are a great option. They are neater than traditional sandwiches. This is a great way to portion out a couple of meals in the car during a long drive." 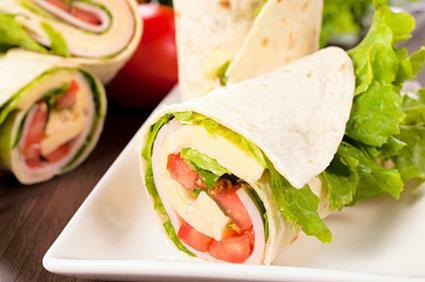 She suggests, "Wrap up your favorite veggies, protein and condiments in a whole-grain wrap, roll it in waxed or parchment paper, cut it in half and you are good to go." There are plenty of great wrap recipes you can try. Of course, if you include any items that require refrigeration, you'll need to store your wraps in a cooler while en route to your destination. Tucker recommends, "A hearty trail mix is a great option for a road trip. It is easily contained, dry and not messy." She makes her own and states, "Nuts, seeds and dried fruits are all nutrient powerhouses providing smooth, lasting energy. Go easy on the dried fruits though, although a natural source, their sugar content is high, and you don't want an energy dip from too much sugar while driving. The company of the fiber and nutrients in the nuts and seeds will tame this some. Add some super foods like goji berries and raw cacao pieces to the mix and you will be energized for sure." If you don't want to make your own trail mix, there are plenty of store-bought trail options that work well for road trips. For example, Sun Ridge Farms makes a variety of trail mixes, some of which are all-natural and some of which are organic. Chips or crackers paired with dip are popular for snacking, but they are often cumbersome and packed with calories. GoPicnic ready-to-eat snack boxes are a great option for people who want portion-controlled, self-contained chip and dip snacks that contain healthful ingredients. Each box contains an individual serving of chips and a coordinating dip. For example, one set includes multigrain pita chips paired with creamy herb dip while another features almond butter and multigrain crackers. These sets are easy to pack and transport, as no refrigeration is required. Popcorn can be a good snack option for road trips. Tucker states, "Making a big bag of homemade popcorn is a good choice to keep kids munching," and adults will also enjoy it. She recommends, "Go light on the salt when seasoning it, as this makes everyone thirsty." Popcorn doesn't have to be homemade to be healthful and road-trip friendly. Brands like Smartfood and Fit Popcorn from Popcorn Indiana are great options. All three brands are gluten-free with no artificial flavors or preservatives and have six grams of fat or less per serving. You can purchase shareable bags or individual serving-size bags. Tucker points out that popcorn "may not be the best choice for the backseat for neatness" and suggests "preparing small individual bags" to cut down on mess. Pretzels can also be a good crunchy snack option for road trips. Any brand will do, but you may want to try something a little different as a road trip treat. Pretzel Crisps from Snack Factory are a particularly tasty baked pretzel option that is unique from traditional bagged pretzels. They are very thin and flat in shape and are quite crispy. They come in a variety of flavors, including Original, Garlic Parmesan, Honey Mustard & Onion, Buffalo Wing and more. They come in resealable pouches. If you are looking for an easy-to-eat snack that provides more protein than popcorn, pretzels or rice chips, the edamame snacks from Seapoint Farms are a great option to consider. This snack provides a great way to get protein and fiber on-the-go. It is also gluten-free and does not have any cholesterol or trans-fat. Options include dry roasted edamame, premium black edamame and blends. You can purchase them in pouches or small, individual serving bags. Nuts and seeds are tasty, nutrient-dense protein sources to enjoy during travels. Whether you love peanuts, cashews, almonds, macadamia or any other variety, they are a wonderful solution for snacking on the road. If you have trouble keeping portions under control, 100 calorie packs of Emerald or Blue Diamond almonds are a good option. If you like trying interesting flavors and new varieties, you'll be delighted by the selection of nut and seed items from NatureBox. Their Sriracha Roasted Cashews are a particularly great option for those who like their nuts with a bit of spice. Jerky can provide another great protein source to enjoy during road trips, and it's one of the only healthful meat options that doesn't require refrigeration. Plain beef or turkey jerky is a good option, but there are also a lot of interesting varieties on the market. For example, in addition to beef and turkey, KRAVE jerky is also available in pork. Their pork variety comes in Grilled Sweet Teriyaki and Black Cherry Barbecue flavors. Beef seasoning options include Chili Lime and Pineapple Orange, while turkey flavors include Basil Citrus and Lemon Garlic. While many pre-packaged snacks contain less-than-healthful items with empty calories, that is not the case with Oscar Mayer P3 Portable Protein Packs, each of which packs at least 13 grams of protein for a filling treat that won't slow you down. These packets have three compartments - one for top quality, preservative-free meat (Oscar Mayer Selects), one for cheese (Kraft Naturals) and one for nuts (Planters). They're great for anyone who is watching sugar or carbs, as well as those who want an easy way to get protein from multiple sources in a single packet. 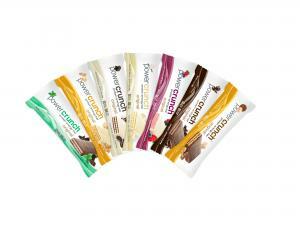 Protein bars also provide a flavorful and convenient way to get protein while on the road. You can use recipes to make your own protein bars or go with store-bought varieties. Read labels carefully, though, as some protein bars have as much sugar and as many (or more!) calories than candy bars without much nutritional benefit. A few good options that are particularly low in sugar include Power Crunch Protein Energy Bars, which are sweet and crispy; nut-based Balance Bars and organic fruit and nut based 18 Rabbits granola bars. Another good option is LÄRABAR® fruit and nut bars, which are very minimally processed, all natural bars that taste great and are very filling. If you're looking for something a little more cookie-like than a protein bar without actually eating a cookie, oatmeal squares can be a good option, assuming you select a brand designed specifically to contribute to healthful eating goals. Corazonas Oatmeal Squares are a good source of whole grains, protein and fiber. They are also heart-healthy, as they include plant sterols to help "lower your cholesterol." Despite all of these nutritional advantages, these squares taste great. They are soft and chewy and come in a variety of flavors, including Orange Cranberry, Banana Walnut, Blueberry and even Chocolate Chip. Detour SMART Whole Grain Oatmeal Bars are also a tasty choice. They are very low in sugar (just four grams per bar) and contain both protein and fiber. These bars are also gluten-free. Four flavors are available: apple, blueberry, cranberry flax and peanut butter chocolate. It can be tough to get enough fiber in your diet when traveling, and flax seed provides a good way to add protein to foods that you are already eating. Carrington Farms Flax Paks are individual serving size packets of milled flax seeds that you can carry along to sprinkle on foods you may eat along the way, such as salads, fruit, etc., as well as mix into yogurt, shakes and more. Each packet adds three grams of fiber and two grams of protein to whatever you're adding it to. Tucker states, "Kids will want treats and foods of their own while traveling." Be sure to have a nice selection of nutritious child-friendly foods packed for family vacations; otherwise you may find yourself making unexpected purchases at convenience stores and fast food establishments for expensive junk food that you'd rather your child not eat. "Making each kid a 'lunch box' is a fun idea," Tucker recommends. "You can include small items like carrot sticks, mini-rice cakes, mozzarella sticks, mini-cheddar cheeses (or cheese of choice), peanut butter and banana sandwiches or peanut butter filled pretzels. For something sweet, coconut date rolls, individual rice puddings, or natural fruit roll-ups are good convenient choices. Go easy on the sugar, even the natural sources, while traveling. The energy can easily pick up for some kids, and most likely you want your kids to be calm and focused during a car ride." If you're taking a cooler, toss in some yogurt in kid-friendly packaging for an easy, filling treat for kids (that the grown-ups might also enjoy). Stonyfield has a variety of kid-friendly organic yogurts, with options specially made for babies, toddlers and older kids. The ones that work best for travel are the squeezable tubes, squeezable pouches, and smoothies. Yoplait Go-GURT squeezable yogurt tubes are also an option for kids to enjoy during travel. 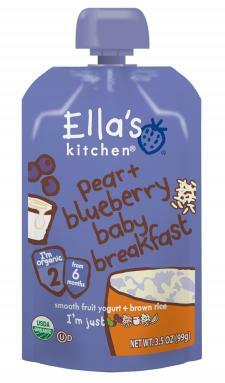 Ella's Kitchen makes 'baby brekkie' pouches that combine yogurt and brown rice in varieties like banana, mango, prune+raisin and pear+blueberry. They are ideal for breakfast, but can really be enjoyed any time of the day. Earth's Best makes infant puree pouches, with options perfect for infants just beginning to eat solid foods through the stage where they begin to transition to the toddler stage. Fruit, vegetable, grain and meat options are available. While it's important to eat healthy, vacation is a time when people often want to indulge. While you should limit these indulgences, a few sweet treats along the way won't completely derail your eating plan while you're on vacation. You probably already have your favorite treats to enjoy on the road, but it can't hurt to try something new. Individually-wrapped snack cakes can be a special road trip treat to enjoy. Though they went off the market for a while, Twinkies are back - and they can be a great travel snack indulgence. Twinkies are part of the Hostess snack cake line, which also includes cupcakes and Donettes, other options that taste great on the road. Chances are that your supermarket also carries TastyKake brand snack cakes in a variety of flavors, including Swiss Rolls, Chocolate Bells and many others. Any packaged item like these will hit the spot when you need some sugar. 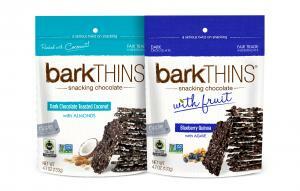 If you are a fan of chocolate and Fair Trade business practices, barkTHINS snacking chocolate is sure to delight you. Flavors include dark chocolate pumpkin seed, dark chocolate mint, blueberry quinoa and more. Most varieties are made with Fair Trade Certified ingredients and bear the NON GMO Project certified label. This delicious candy comes in a resealable pouch, so you can break off small chunks to savor, or select a larger slab for a truly indulgent treat. If you're traveling during the summer, you'll want to keep this item in the cooler so it doesn't melt. If you love both chocolate and coconut, Coconut Patties from Anastasia Confections are a tasty travel snack indulgence. These treats have a creamy coconut center that is dipped in dark chocolate. The Classic Original Flavor tastes only like coconut and chocolate. Other varieties have other flavors mixed in, such as rum, mango, orange, lime and more. They are individually wrapped for convenience, though you will want to keep them in a cooler if you're traveling during hot weather. If your sweet tooth doesn't lean toward chocolate, licorice bites are a good option to pack for road trips. While long strings of licorice can get messy in the car very quickly, bite-size pieces are a great option. Red Vines Bites from Red Vines Candy are a good choice. They come in red and black licorice flavors. Choose individual portion pouches or larger bags that you can pass around for everyone in the car to share. Tucker states, "Hydration is key when driving, both due to the air quality in the car, and for some on those longer trips, not drinking water to avoid frequent bathroom stops. The heat or air conditioner in the car can be very dehydrating. And for most of us, to keep our energy up, we will be drinking and/or stopping for coffee, which is also dehydrating." She points out, "Dehydration can make you groggy, unfocused, and for some, achy, so keeping hydrated is of vital importance." Spills are a consideration for drinking in the car, though. The Wow Cup is a great spill-free option for kids and accident-prone grown-ups. Tucker states, "Coconut water is a convenient hydration drink to bring on trips. It is available in almost all grocery stores now and comes in individual containers with attached mini-straws. It will sustain your thirst for quite a while. Filled with minerals and natural electrolytes, including potassium, it regulates the body's water balance. Kids enjoy it as well, due to its sweet quality." She advises, "Stick with the plain and unsweetened ones for optimal health benefits." Individual containers of fruit juice are excellent selections for road trips. 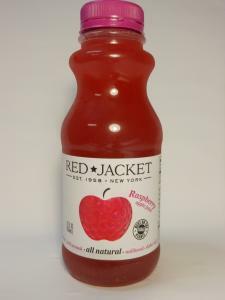 Red Jacket cold press juices are a great cold-pressed option if you're looking for an all-natural beverage in individual serving containers, though you will have to keep them in your cooler throughout your trip. If you're looking for something that is shelf-stable, juice boxes like those from Apple & Eve or Juicy Juice are a good choice. Tucker suggests, "If you have a cooler, you may also want to pack some fresh green juice, either that you make at home, or buy fresh at a juice bar the day of, or the evening before your trip. These are very hydrating and nutrient-dense for the road, though they will only last about two days." Tucker suggests, "You can also whip up a green smoothie or protein shake or smoothie of your choice before you leave, put it in a thermos and carry it in the cooler for a refresher and energy boost down the road." Tucker points out that "these will only be good for about eight hours," so you'll want to enjoy them early in your trip. Tucker points out, "Commonly, it's the unplanned eating times that leave you making unwise choices and just making do. Along the road, if you depend on restaurants, diners and fast food joints, there is no way around it - highly processed foods, high sodium and high sugar, and in return, low energy." She advises, "A little planning goes a long way for a healthy road trip. Build your meals and snacks into your packing list as you are preparing for your trip, including getting a good cooler and convenient containers and utensils to take with you. These items are not expensive and certainly you will use them multiple times." Note: The author received review samples of many of the brand name products suggested in this article. The suggestions presented here are solely based on the opinion of the author, who is a frequent traveler.